This church still miraculously standing in Iznik has had a rough millennium, as you will almost certainly be able to tell from its haggard appearance. 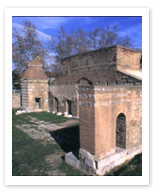 Destroyed by an earthquake in 1065, rebuilt, converted into a mosque in 1331, damaged by the Mongol invasion, set afire, reconstructed by Ottoman chief architect Mimar Sinan, abandoned, and shelled during fighting between Greek and Turkish troops, perhaps its biggest wonder is that it stands at all. In Istanbul they often say that in an earthquake, you might be better off in an old 15th century house than in a modern, earthquake proof building. After all, what’s one more earthquake if you’ve stood for 600 years of them? Taking that same logic, you should be okay in the Haghia Sophia should fire, plague, war, earthquakes, crusades, democracy, industrial revolutions, or invasions break out all around you.